Most businesses we talk to have an incredible passion for providing a product or service. Hundreds of customers a week walk through their doors. But, they never know who they are or how to get them back. Well now you can, with Customer Retain. Your location is setup within the portal and a unique SMS number is provided. This number allows both incoming and outgoing SMS and is connected to our online review portal. 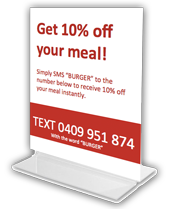 Specially designed counter signs are customised for your brand and message and positioned in key areas within your business. An automated contact manager collects all the contacts from your Opt-In campaign and builds your customer database. Our clever system segments your customer data so you can send personalised messages by email or SMS at a later date. Send weekly, fortnightly, monthly or quarterly communications to your customers. Searchwords has a strategy team to help you create the perfect communication to drive loyalty, retention and most importantly, more revenue to your business.